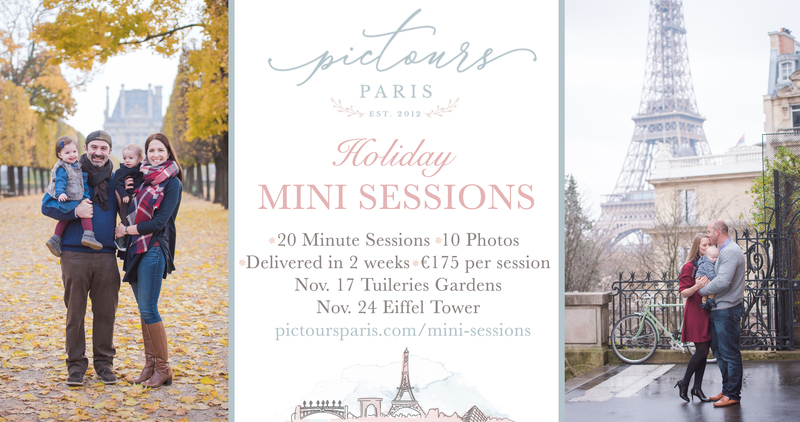 Pictours Paris is offering Mini Photo Sessions, just in time for the Holidays! Each session is 20 minutes, and includes 10 digital photos, delivered within 2 weeks. The price per session is €175. Mini sessions will be held on November 17 & 24 between the hours of 8:30am to 12:00pm and 1:30pm to 5:00pm. Times will be assigned on a first come, first serve basis. A €75 deposit is required at the time of booking via paypal. The remaining balance of €100 can be paid in cash the day of your session. You will receive an email confirming your reservation and scheduled time, along with the deposit link shortly after submitting the form. Deposits are non-refundable. Sessions will take place rain or shine. As these are mini sessions, please arrive 15 min before the start of your session. If you are late we cannot guarantee the make up of lost time.